Culottes have become very popular over the past season but it has taken me some time to finally try it out. When your wardrobe consists of 99% skinny jeans, it's not exactly easy to try such a different shape. But when I found this amazing pair (on sale, no less) I knew it was time to try it out. I love how just with a basic turtleneck the look feels so polished. 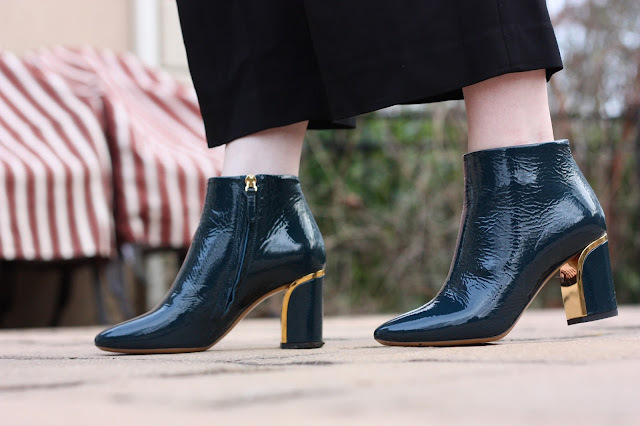 And the all black outfit is the perfect look to wear these amazing new Chloe boots with (also an amazing sale find). They're a beautiful greenish/blue color but with the lack of color in my wardrobe they can easily be treated as a neutral and will be worn with almost anything.